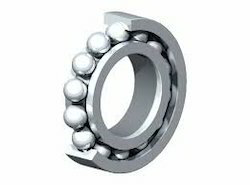 Wide type bearings are similar to single row deep groove ball bearings, having standard bore and outside diameter, but thickness is same as double row bearings of corresponding sizes in inch dimensions. Extra thickness in this bearing provides layer support area for shaft and housing contact and also space for pre packed lubricant which has sufficient place for grease expansion under agitation. Due to wide play seal these bearings are suitable for electric motors where it simplifies housing design. Bearings are also available in mechanic seals.